I'm sorry .. 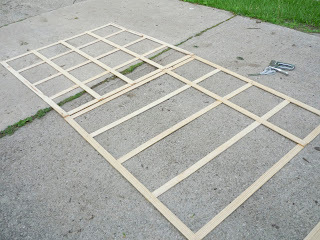 I promised you a trellis tutorial last week and didn't follow through on it! I ran into so many problems with it, so I kept leaving and coming back to it. Finally it's perfect! Trial and error is the best way to describe it. I've been keeping busy with other projects (you'll see those soon, too). I've finally gotten around to playing with Camera Raw to edit the photos; it's a sub-application of Photoshop. Camera Raw makes it super easy to make a great difference in the quality of your photos, here's a simple tutorial courtesy of Etsy if you're interested in finding out more. On with the tutorial! 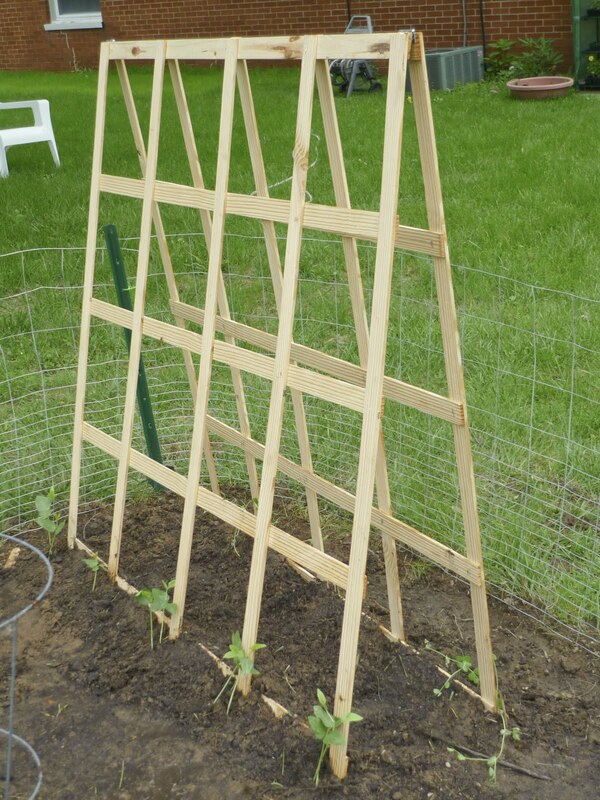 I saw a folding trellis similar to this one at Lowe's for around $20. 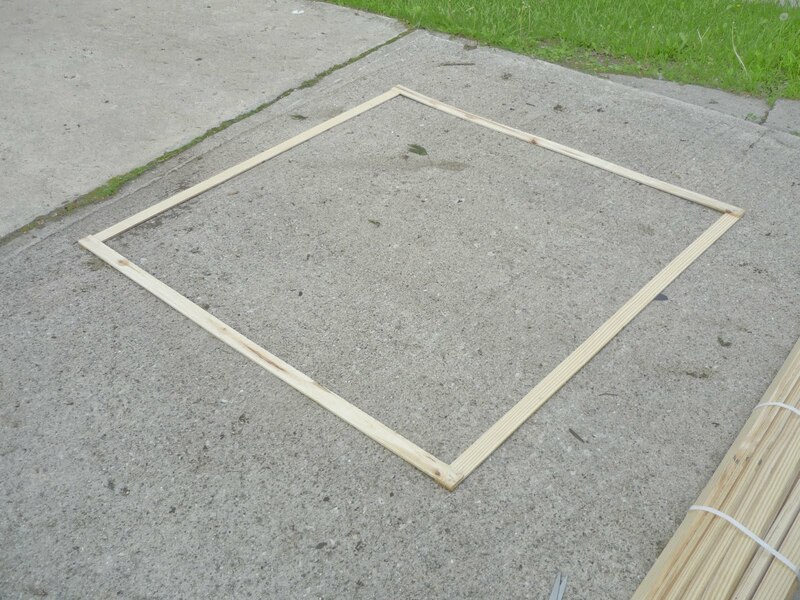 I am a thrifty person, and didn't want to pay that much for some wood and staples, so I decided to make it myself. 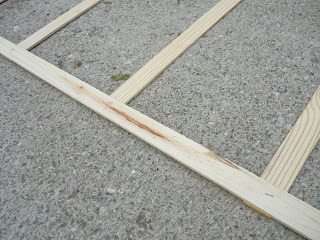 Each folding ended up costing around $9.50 for wood and hinges (I borrowed the staple gun and staples). Half price .. not bad! Update: If you cannot find these slats at Lowe's, call around to or check at other home improvement stores with lumber sections (Home Depot, Menard's, etc.). I had a reader comment that she wasn't able to find these at her local Lowe's. Here's what you need: a bundle of wooden slats (these are from Lowe's and cost around $13 for fifty, you can make two folding and one single trellis out of this bundle), a pack of rust-resistant hinges (mine are zinc coated) or 4"x8" of heavy duty plastic (see hinge photo below), a staple gun with 1/2" staples, and some type of staple remover for mistakes (scissors, flat head screw driver, etc.). 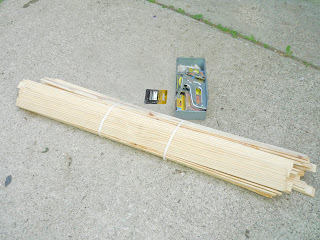 EDIT 3/22/13: You also will want some wood glue. 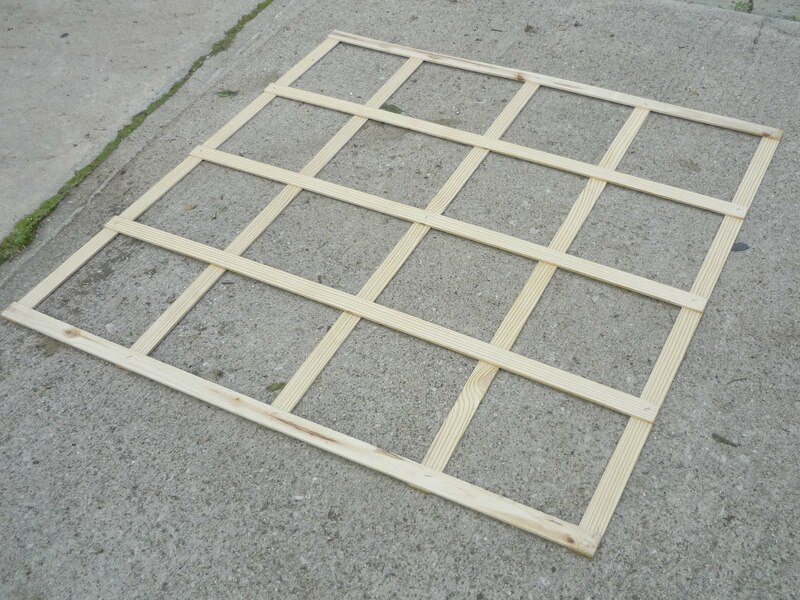 Make a square with four slats by placing two slats parallel on the ground, then two more on top of them. 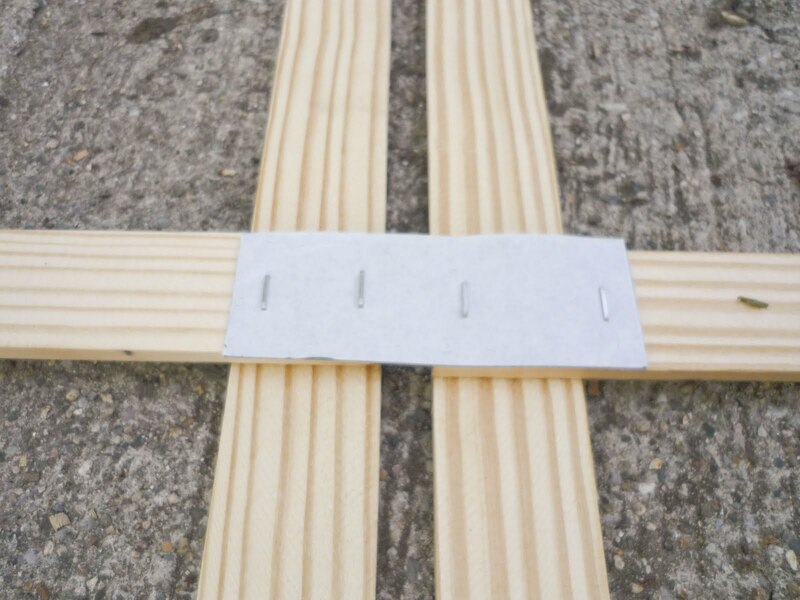 Glue then staple to secure. 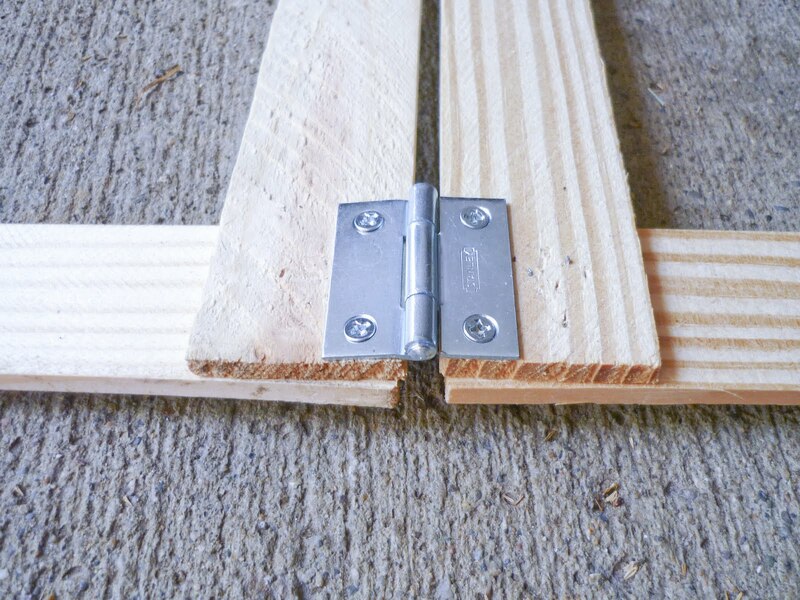 I would recommend at least two staples per joint. 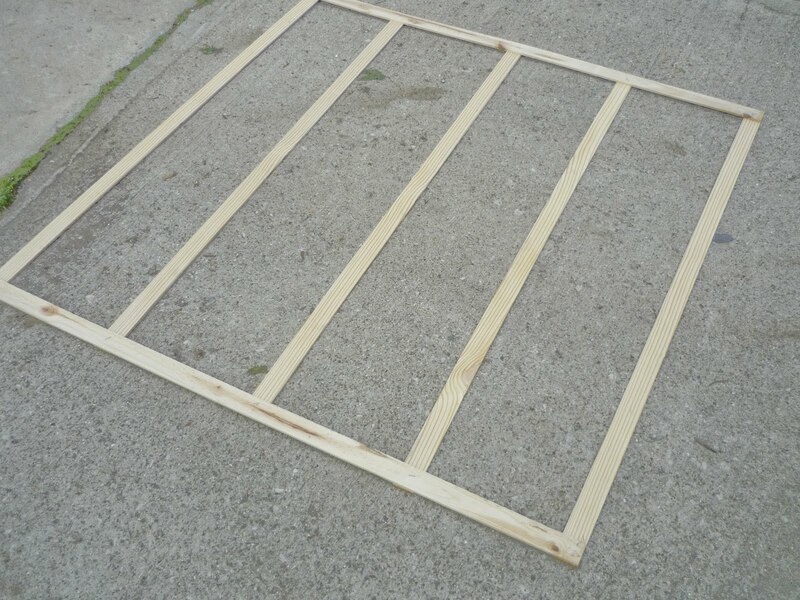 Evenly space three slats parallel to your first two slats. 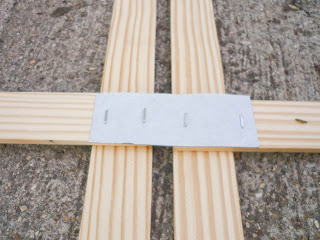 Glue and staple in place. See how the parallel slats all go under the slat they're perpendicular to? Overlay three evenly spaced slats so they cross over the previous. 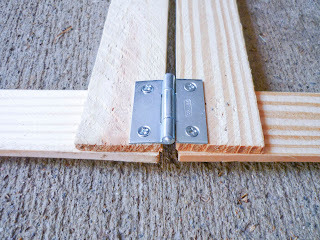 Glue and staple in place, and glue and staple at each of the center joints. Let the wood glue dry per bottle instructions. 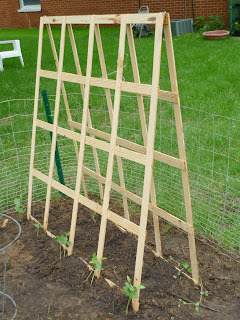 Repeat to make another trellis.